I used up the last of my full-size Soap and Glory products this month – I fell in love with the brand a few years ago, acquired tons, and then used them so much I gave myself S&G fatigue. After a gap of about six months where I didn’t use them, I returned to the S&G fold refreshed, and really enjoyed using these. 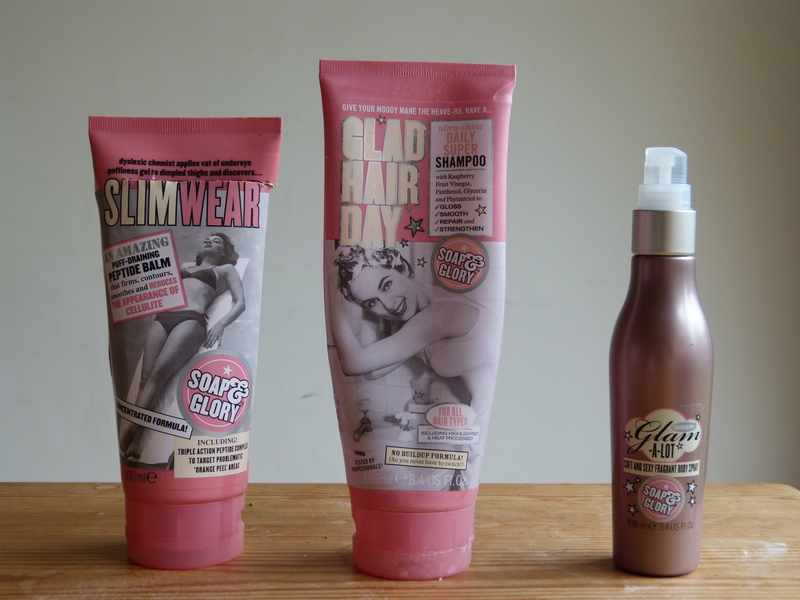 Here we have Glad Hair Day shampoo, which I liked but didn’t love (review here), Slimwear Cellulite Cream, which was disappointing (review here), and Glam-a-lot body spray, which was a gorgeous scent, but I don’t love body spray. I wouldn’t rush out to buy any of them again, but I’d happily use them should they come my way! 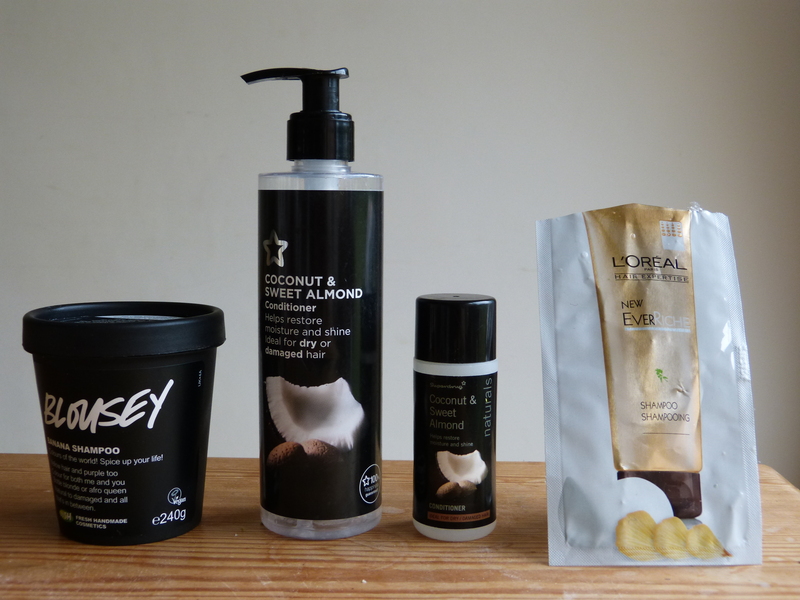 It was quite a slow month for hair products – I used up a pot of Lush Blousey shampoo, which I raved about here, and a mini and a full size of the Superdrug Coconut and Almond Conditioner, which I’ve already repurchased and stashed as my new favourite ‘finishing off a shampoo’ conditioner (don’t you hate it when sets run out at different times?). I reviewed that here for you. Then finally, I used a sachet of L’Oreal EverRiche shampoo, which I really liked. My hair felt good after using it, and it was nice and rich with a great lather. I can see myself buying this in the future, if I don’t get distracted by other pretties! What did have a busy month was moisturiser! This sachet of Palmer’s Cocoa Butter cream was absolutely gorgeous, but I really didn’t like the smell. It was a wonderful heavy-duty moisturiser though, so I might have to grin and bear the smell if my skin gets moany about the cold. It’s not horrible, just chocolate-y, which is not really my thing! You can tell I liked both the REN Moroccan Rose body cream and the Nip + Fab Dry Leg Fix if you see my “Battle Of” post here. 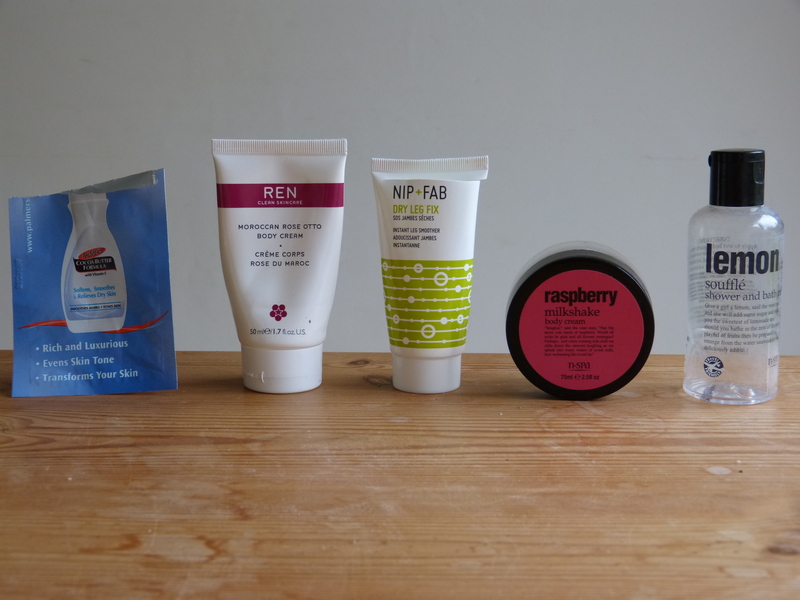 Next up was an NSpa Raspberry Milkshake body cream, which had the most lovely fruity scent, but was way too wet for me – this range has been gone from Nirvana for about a year, and I’m still getting through the stash of their products I have! Then on the end is a sole tiny body wash, the NSpa Lemon Soufflé shower gel – I did wash this month, promise! I just used this very slowly because it was such a thick formula. It’s very nice, but from the same discontinued range as the body cream. 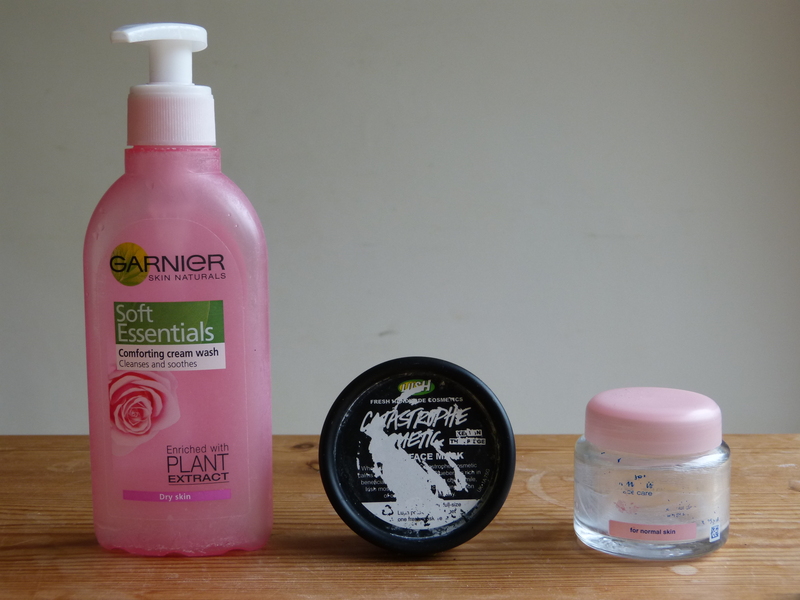 Some skincare bits next – I’m very happy to have finished the hated Garnier Soft Essentials Comforting Cream Wash. I never recovered from the disappointment of finding out this didn’t actually smell of roses (come on, Garnier, that’s cheating!) and I realised while using it that I don’t like foam on my face, and boy does this foam. I used a lot of this to shave my legs – if it’s the right consistency for that, I don’t want it on my face! One thing I did love is Lush Catastrophe Cosmetic face mask, which I will always repurchase (as long as my skin stays the same) – this is my Holy Grail mask, and has already been replaced. Lastly, a very battered pot of Johnson’s Daily Essentials 24hour Day Cream, which, although not very exciting or fancy, is my day cream staple – it just seems to really suit my skin. I’m already using my next jar. Odds and ends… This Charlie Silver perfume was a present from Boyfriend’s grandparents, which was very sweet of them! I really liked the scent of this, and wore it a lot over the summer, as it was a refreshing scent. More boringly, I’ve used up my last spray deodorant, Soft and Gentle Extra Fresh Lotus and Watermelon. I bought this to keep at Boyfriend’s house when we first got together, and while it smelled nice, it was a crazy spray that filled the air when you used it, so I tried to keep use minimal. I wouldn’t buy again, because no sprays from now on! Most boringly, my standard Cutex Nail Polish remover – it does the job, and it’s cheap. 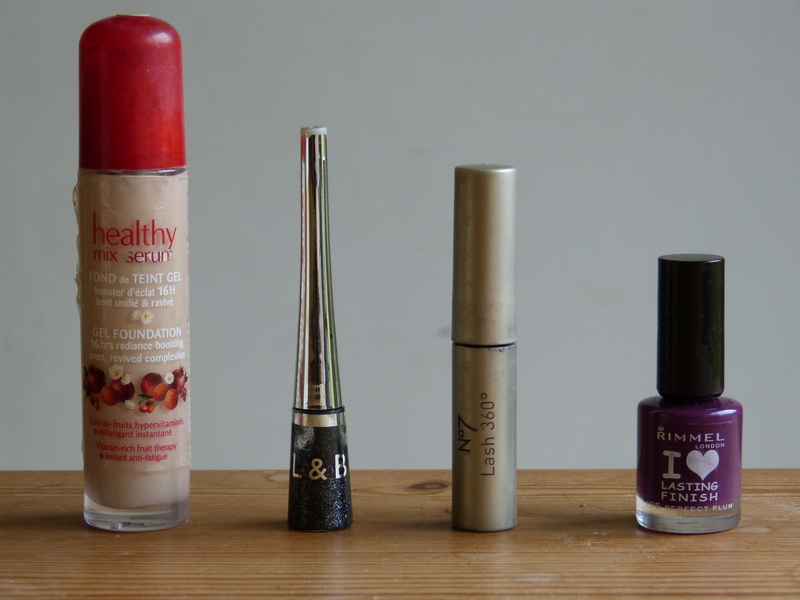 Aaaand, some rare make up empties! First up, my beloved Bourjois Healthy Mix Serum (51), which was an instant repurchase. The only thing I don’t like about this is that it’s impossible to get it off the sides of the pump, argh. I hate the waste of it. The L&B black glitter eyeliner got a bit dried up, but was a nice product while it lasted (about a year). Sad sad times, my No7 Lash 360 Degree mascara has bitten the dust and become too dry to work with. The search is on for a new Holy Grail mascara – I’m gutted I can’t buy this any more! Then lastly, Rimmel Lasting Finish Nail Polish in Perfect Plum – this had started to get a little bit gloopy, and I realised I didn’t particularly like the colour any more, so I’m ditching it! 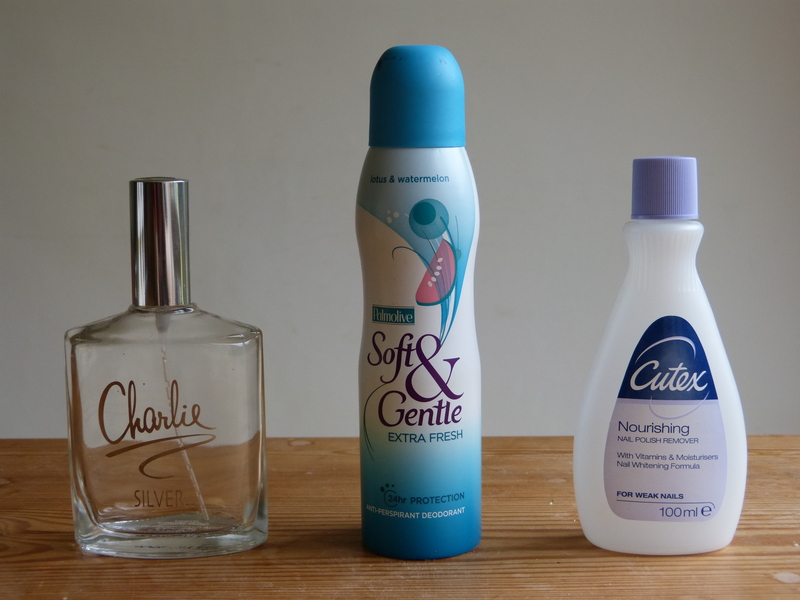 And that’s it for my empties – a hell of a lot of products! Anything catch your eye? 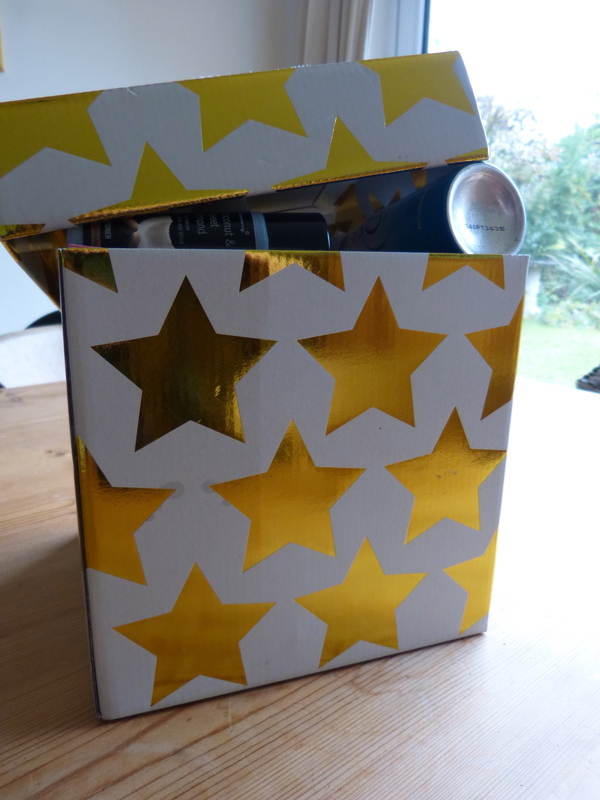 This entry was posted in Beauty and tagged beauty products, beauty reviews, body cream, day cream, empties, haircare, lush, make up, moisturiser, september empties, shower gel, skincare, use ups. Bookmark the permalink. I’ve heard a lot of mixed reviews about the Bourjois Healthy Mix Serum but I really want to try it but I’m not sure if I should! You used up alot, its so satisfying, I love using something up & being able to open something new. I like REN products and there are so many things from their range I want to try.